Unfortunately the Continental Sloop Providence has met with some financial troubles. The Providence Maritime Heritage Foundation is currently spear-heading an effort to keep this historic vessel afloat and to keep alive her mission of learning under sail. If you are in a position to help this unique vessel on its journey of learning, whether it be a donation or volunteering your time in the Providence, RI area, please email us, and we will let you know how you can become involved. Thank you. It is just prior to the American Revolutionary War. The British, in an effort to dominate the shipping industry, have placed regulations on the size of American ships. Colonists could do little to counter these measures, and in order to keep their own shipping industry alive, they became fast! To gain more sail area, and consequently more speed, the colonists began building ships with unusually long bowsprits. This would explain why The Providence, which was built as a merchant vessel, had a 110 foot sparred length, but was only 65 feet on deck. The Providence served the Continental Navy well, but met her unfortunate demise at the hands of her own crew. She met with a slew of British ships in Penobscott Bay Maine and her captain decided that instead of running out to sea where she could be pursued, it would be better to head up the bay in search of shallow water where the cumbersome British ships couldn't go. Unfortunately instead of finding shallow water, she found only a waterfall. Since ships were a valuable commodity, it would have been a mistake to let the British capture such a victorious American vessel so the crew scuttled her and began the long walk back to Boston. More information on why Providence was needed can be found on the HMS Rose's history page. Today's Providence is a replica. Its rigging and size are nearly identical to the original Providence's with a few exceptions. She was built in preparation for the 1976 bicentenial. She has logged over 100,000 nautical miles, sailed to 113 ports in 18 coastal states and 3 Canadian provinces on the Atlantic Ocean, the Gulf of Mexico, the Chesapeake Bay, Long Island Sound and the Great Lakes. 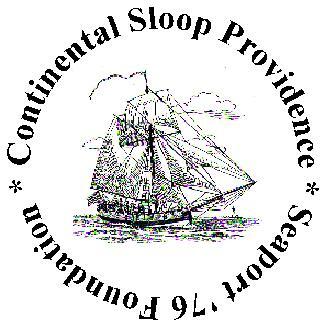 Unfortunately the Continental Sloop Providence has met with some financial troubles. The Providence Maritime Heritage Foundation is currently spear-heading an effort to keep this historic vessel afloat and to keep alive her mission of learning under sail. If you are in a position to help this unique vessel on its journey of learning, please email us, and we will let you know how you can become involved. Thank you. chronicling the nefarious careers of pirates throughout history. extras in the final production. Check out Maritimes 95 This amazing site follows the 70 foot ketch "Cristobal" around the Canadian Maritimes with the tall ship fleet and the HMS Rose in particular. Really good tall ship pics! This page was constructed and is maintained by John B. Constantine, Jr. This page is forever under construction as comments and information come in.